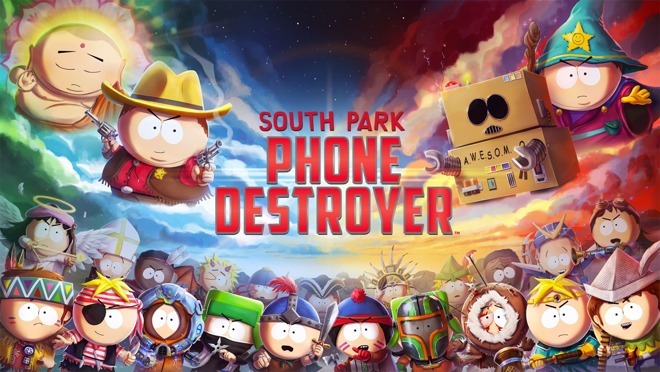 Developed by Ubisoft studio RedLynx in collaboration with South Park Digital Studios, the free-to-play "South Park: Phone Destroyer" is now available to download from the iOS App Store. The mobile title is a collectible card game that takes players on a tour of the town, which plays the backdrop for the animated TV show. 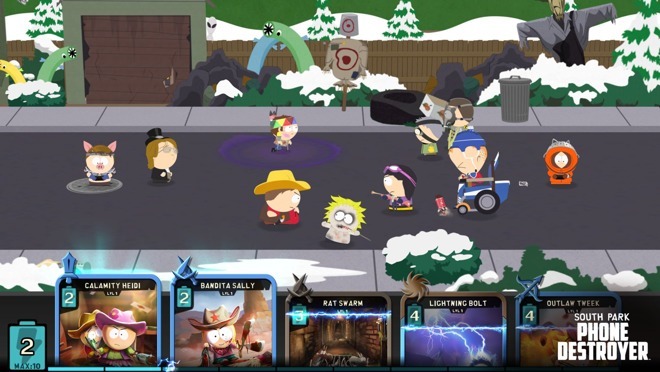 Starting as a new kid to the area, players can take on a 60-level single-player campaign, fighting alongside and against the main characters, as well as alternative versions including Cyborg Kenny and Grand Wizard Cartman. Teams of characters dressed as cowboys, wizards, and others can be assembled and then sent into battle to pass each level. Over 80 unique cards are available to collect in the game, with challenges providing extra bonuses during battles and deck upgrades. Along with real-time multiplayer battles, the game also allows players to team up with others, including team chat and the ability to share cards with teammates. While the game is free to play, with expected in-app purchases, Ubisoft does mention in its marketing material that "everything can be earned in the game without paying," with no items hidden behind a paywall. Ubisoft has also pledged support for the game after its release, with expansions to the app arriving sometime in the future to keep the game fresh. Included as part of the game is a dedicated iMessage app, which features 14 animated stickers of main character Cartman that users can add to their communications. "Pro Evolution Soccer (PES) 2018 Mobile" is an annual refresh to Konami's "PES 2017", which arrived in the iOS App Store on November 6. Updated with data to match the start of the 2017-2018 season, "PES 2018 Mobile" is a soccer game with elements both on and off the pitch, giving the opportunity to play soccer and to manage the entire team. During matches, players can control the action by swiping to pass the ball and tapping to shoot, with "Advanced" controls offered for more precise actions, as well as a "Classic" virtual gamepad. Off the pitch, teams can be refined by scouting for new talent or acquiring players from other teams, with official club partnerships allowing thousands of real-world soccer stars to be traded within the game. The links with clubs also extends to the UEFA Champions League, with official visuals from the league being shown as players compete against the top European teams. Well-known soccer stars will be available to add to player rosters to build the ultimate team, with David Beckham included at launch, with Diego Maradona, Steven Gerrard, and Michael Owen arriving in the near future. New for 2018 is the "Friend" feature, which enables real-time online multiplayer against specific opponents, with options for "Local Matches" and "Local Leagues" allowing players to hold their own tournaments. Other improvements include the chip shot and controlled shot for matches, and an overhaul of the game's audio and graphics. Free to download and taking to 1.64 gigabytes of storage, "PES 2018 Mobile" is compatible with the iPhone 5s, iPad Air, 6th-generation iPod Touch, and newer models running iOS 9.0 or later.